Tilden is a decent-sized park on the Berkeley Hills providing quite a wide variety of recreational possibilities. This includes many trails open to bikes as well, though you shouldn't be looking for much first-class singletrack here. Most bike-legal trails here are fire roads and "family-grade" paved paths. 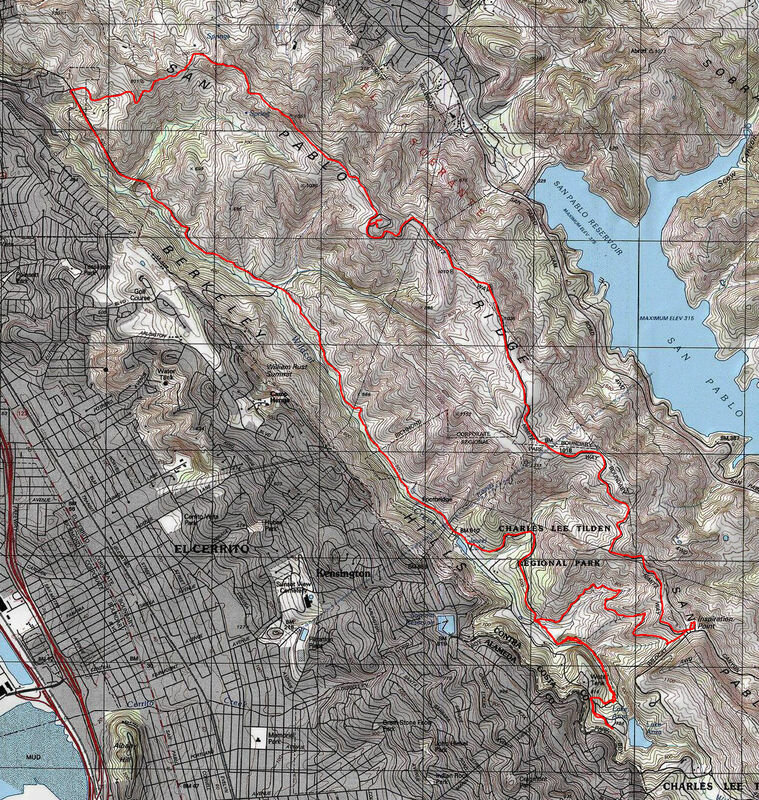 This ride is a fairly long but very tame loop along the San Pablo ridge starting from Tilden Park and then also traversing much of the neighboring Wildcat Canyon Regional Park. Most of the ride's mileage is split between fire roads and a paved trail, but a small amount of included singletrack mileage adds a little flavor. For those who will be driving here for the ride, there are several free parking lots in Tilden Park. There could be other parking lots in the park from which this ride could be reasonably started, but I have a good reason for picking the lot near Lake Anza: it allows you to include Wildcat Gorge Trail in your ride, which is the route's only singletrack and the only trail segment on the ride with features that could be considered to be technical. Meanwhile, for many folks in Berkeley and its surroundings, it could be just as sensible to bike your way here. However, it's worth noting that, from most locations, reaching the park by bike will involve a significant amount of additional climbing, which could prove important to anyone who is interested in this ride due to its relatively low physical difficulty rating. At the beginning of the ride, a short stint on the park's paved roads takes you to Wildcat Gorge Trail. This trail is tucked in tightly next to Wildcat Creek as it passes through the park's dimmest and narrowest valley. This could be the part of the ride that holds the most riding interest for a mountain biker. While it's not always super narrow, Wildcat Gorge is a trail that I consider a singletrack, which is partially due to its attitude and difficulty. You'll encounter short, punchy ups and downs on this trail, a couple of which were covered in tree roots and quite techy at the time of my latest ride. There are also a couple of creek crossings on this trail, at least one which was of a difficulty that could rate anywhere between sketchy and impossible, depending on the rider attempting to ride it. This fun trail lasts for only about three quarters of a mile, unfortunately. But, the silver lining in this is that you get to traverse it again near the end of this ride. I should add, however, that Wildcat Gorge Trail is closed in wet conditions. At the end of Wildcat Gorge Trail, the ride's extended fire-road climb begins, which is on Meadows Canyon Trail. This trail climbs with a reasonable slope, almost never exceeding 10% and often closer to 8%. After the first half mile of the climb, the slope becomes less uniform, but even the steeper spells after that aren't much worse than 12% grade. While the grade begins to slacken noticeably as you get higher, you suddenly arrive at the steepest climb of the ride as you get closer to Inspiration Point. This final part of the climb (continuing on Curran Trail) lasts less than a quarter mile but includes a few spots that reach or exceed 18% grade. Overall, this climb on Meadows Canyon Trail serves as little more than a vehicle to get you to the higher part of the loop. It's not very interesting and, although you catch a few nice views of the nearby, verdant hillsides, these views pale in comparison with what the rest of the route has to offer. When I had first posted this ride route on this site, this loop was traversed clockwise, making Meadows Canyon Trail a descent. Following an early viewer suggestion, I've made the loop counter-clockwise, which seems to work better. Meadows Canyon Trail is a reasonable climb, and it's probably more fun to descend the steep Belgum Trail with open views in front of you. Reaching Inspiration Point at the end of the ride's only noteworthy climb, you might have expectations of finding a reward there. Unfortunately, you might be disappointed. It's not hard to imagine that there must have been some inspirational views of the San Pablo Reservoir from this spot once, but the trees and bushes now obscure most of it. There's little here today other than a medium-sized parking lot, though you'll still find a couple of information panels and a dedication plaque for Nimitz Way if you're the curious type. The ride continues on the paved Nimitz Way trail after this. This is a wheelchair-accessible path that extends for four miles. The trail doesn't have much elevation change for most of its length, though it does have nearly a mile-long stretch near its end where it loses close to 150 feet of net elevation, followed by a half-mile climb where it gains it back with some interest added. Situated along the spine of a relatively high ridge, parts of the trail are quite scenic. In the earlier parts of Nimitz Way, you go through some patches of trees too and you only get a handful of peeks toward the east and toward San Pablo Reservoir. As you get further north, the setting of the trail turns more into open grassland and the views open up further. Right around the end of the end of pavement on Nimitz Way, the trail also goes by the site of an old Nike missile site. You can pedal up a few dozen feet from the trail to see the concrete foundations left from this installation. This is actually relatively common in the Bay Area and several other rides listed on this site allow you a similar opportunity. After Nimitz Way, you continue onto San Pablo Ridge Trail, which is a fire road that continues to trace the top of the ridge by the same name. These parts of San Pablo Ridge get a little "humpy". While the trail steers around one or two of these humps, it goes right up and down some others, which results in segments with the steepest slopes of the entire route. There are descents with slopes like -30 to -35 percent in this part of the ride, though those numbers are hit only momentarily in each case. There's also one memorable stretch on San Pablo Ridge Trail where it plunges toward its junction with Greenridge Trail in a descent that is so steep that it's sketchy due purely to its slope. My GPS recording for this stretch shows numbers that make me suspect the slope exceeds -50%, which is ridiculous. An even shorter but considerably less steep climb after this brings you back up to the spine of the ridge where you pick up Belgum Trail. After its first few hundred feet, Belgum Trail is an unbroken descent of a much moderate slope. It's a fairly scenic one, too, but it doesn't last very long. The trail starts passing through clusters of trees in its lowest elevations and you find yourself on pavement shortly before you reach Wildcat Creek Trail. This is not a road open to traffic, though. It's an ex road that's now a park trail. With the exception of a brief interlude on dirt, the paved trail surface continues through the first half mile or so that you cover on Wildcat Creek Trail. Calling this stretch a "paved trail" sounds misleading, though. This is wide enough to be a spacious two-lane, including its paved shoulder spaces. No doubt, that's what it was at some point. At one arbitrary spot, this ex road unceremoniously transforms into a fire road and continues on as one after that. This is a moderately wide fire road that's non-technical. If you look at the elevation profile plot, you may notice that you gain some net elevation over the 3.7 miles you cover on Wildcat Creek Trail, but this 150-foot gain is not enough to make this long stretch feel like a climb. It feels like a level trail with only some local rises and dips. With the exception of one short uphill effort in the early part of the trail where it's still paved, the only real climb on this trail is a segment less than a quarter mile in length arriving around the 11.5-mile mark of this route where you see grades in the neighborhood of 20%. Otherwise, Wildcat Creek Trail is little more than a mellow dirt road that closely follows Wildcat Creek. It features some of the shadiest stretches of this ride, but even here, the tree cover is patchy at best. Wildcat Creek Trail ultimately leads you back to some of the densest areas of Tilden Park in what's called the "Tilden Nature Area", which contains picnic areas, the Little Farm, Jewel Lake, and a fairly high density of hiking trails including a boardwalk (Lower Packrat Trail) through a small cluster of wooded wetlands. You won't have direct access to most of these on a bike, however, because bikers are routed around this area via a fire road called "Loop Road" to be dropped back where Meadows Canyon and Wildcat Gorge Trails meet. Before that detour, you can still take a peek at Jewel Lake and at the spillway of its dam, though.